I began writing when I was 10. Having written my first poem I was very happy when my teacher had displayed it on the notice board for weeks together. Gradually I entered my teens and love happened. And so was born the poet in me. Love, love and more love that's all that I could write about. It all meta morphed only into poems - lyrical and rhyming. Love brought along heart break and pain which only deepened my poems. Somewhere in the coming years that poet got buried beneath the hurt, jealousy, anger and the other things that come along with busy-ness in life, leaving me no time to pursue what my heart loved the most. Very soon my first love, with words was forgotten. Many years later one random TV show pushed me to try my hand at writing and very soon was my blog born. I treaded on this path with a lot of caution as I was not too sure about where was it all leading. And then one night I realised that "this" was the only place on earth where I could just be ME. Hence the reason I call myself Me here on both my blogs. For in this world, however democratic we call ourselves, our voices still go unheard many a times.My blogs provide me a safe corner where I can just be myself and say all that comes to my heart without having the fear of being judged or ridiculed upon. For this is my place, just to scribble all that comes to my mind. My heart spells a desire which can be expressed through words. My mind analyses somethings which nobody is willing to listen. My soul wishes a million things that find a voice in the alphabetical mode. My fingers itch for the feel a blank paper gives... symbolizing hope as it awaits to be written with all that I want to on it. My eyes capture all that it witnesses around and then develop the negatives into beautiful pictures using this technology. 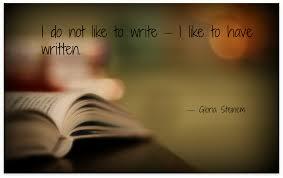 Today all that I want to do it write, write and write for it is and therefore I am. Poetry I believe is falling in love over and over again. Got to know how you became a poet.I wish you write and more you write and write ur success.GBU. Please do write, write, and write. Never leave it. All the reason you enlisted stating why you write, are...just..beautifully written! 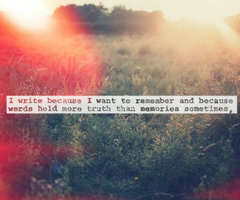 :)Sure dear...and with lovely people like you around... all I can say is I will write till I breath! Keep writing, Me because your writing is not empty.Pl.read my latest post which has something related to your this post.Only a coincidence. Oh yes it surely does....! Capturing moments into pictures is easy, expressing them later with words is the tough part. A writer pieces together different moments and creates something new. Nicely written. 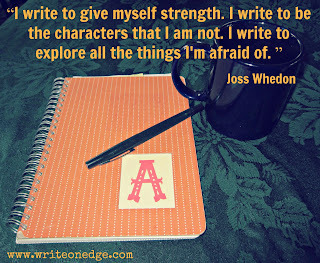 Its a beautiful post which outlines the love people have for writing so beautifully. And yes the photographer in me loved the element of negatives being converted :) A lovely read!